Brown Wedges, White Purse: Thrifted. Hello, hello there my lovelies! How I missed you all on this terrible blog break that I've had... It just about killed me to not be able to blog the past few days because I've had so many wonderful things to blog about! Without my computer not only could I not do blog posts, but on my dad's laptop it wouldn't let me post comments either :( Thankfully all of that nonsense is done with now and I have my computer back! Hip, hip, hooray! Lauren! You look so, SO radiantly beautiful in these photos! You are so naturally gorgeous, girl! Also-- I've been meaning to comment on your recent posts but kept forgetting. I've had you in my thoughts & prayers since though, and hope you realize what a gorgeous soul you are & how loved and appreciated your are by so many. Just a question (and hopefully your comment boxes work this time haha), where exactly do you take your photos? Your choice of scenery is so tranquil. There you go looking fabulous and cute in that adorable bright blue hat again! It was so great to meet you, and I hope we get to meet up again soon. YOu look incredibily cute! That hat is so beautiful and look perfect with that dress. I've been away from Internet (I was on vacation) for a few days and I still have to read all your previous posts! Re your title, I see scars as emblems of strength too; proof that healing happens, incrementally and inevitably. Adorable look. The dress looks great with that hat. You look adorable! This is the cutest outfit I've ever saw. Glad your back online and posting again. Have a great weekend!!! I love this cute outfit! 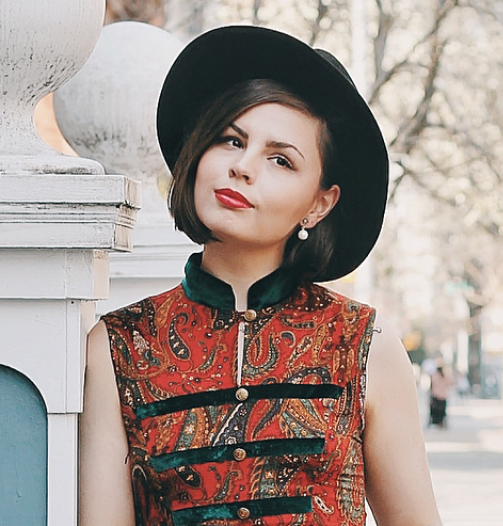 The beret matches perfectly with the print on your dress. I love how you wear berets. I really want to find one and wear it for fall. Everything about this outfit is perfectly put together. Even the little socks!